Oh man am I ever glad you asked! This year, like many past years, we didn’t make any official resolutions. But, I guess you can say this is sort of something we’ve decided to try to stick to in the new year. I guess you can say that goes along with a form of resolution, right? 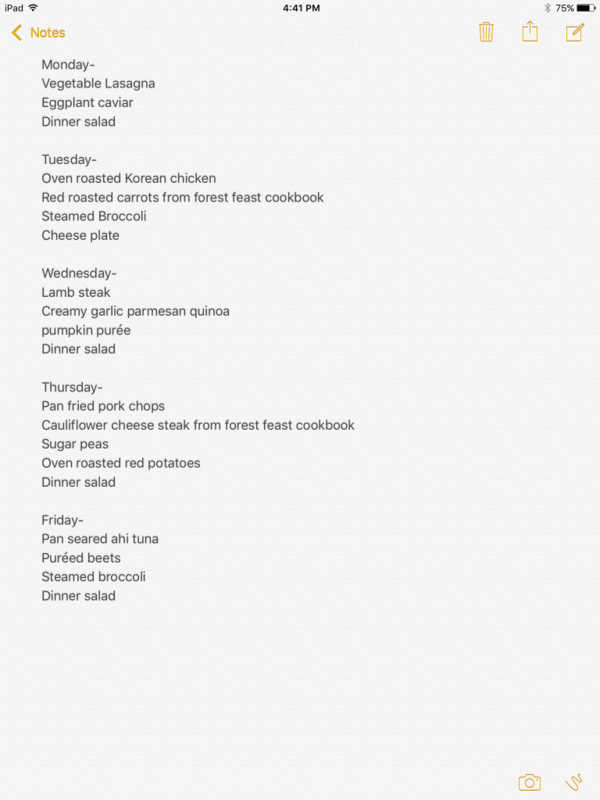 Weekly dinner menu planning. Boom. It sounds so simple, right?…It is! So… Uh… Why haven’t we done this in the past? …… clueless. Anywho. We did our first full week of dinner menu planning and it looked a little something like this. We’re trying to incorporate a ton of veggies into our meals too. Oh! Plus I got my hot little hands on this really cute weekly menu planner stationary/ a store list. I cannot wait to share with you all! Stay tuned on Instagram. (Thanks Jenny!) We had a really good time sitting down together and planning meals from our cookbooks and must bake/make bucket-lists. I know it’s a time I’m going to look forward to in our future. Our goals are to incorporate more veggies, take the stress out of any weekday scramble of what’s for dinner tonight, plus try to make fewer trips to the vegetable stand and grocery store. We will promise to keep you posted with delicious photos along the way. Follow us on Instagram if you aren’t already. Speaking of delicious photos… This is one meal from our past week of dinner planning, minus the dinner salad. Meh. Sometimes you see one, you’ve seen them all. ^ Armenian eggplant caviar. I get the sweetest memories of our dear friend Mary when I take a bite of this stuff! Hi Mary!! We hope you enjoy every bite! Yield: 6 servings (12 to 15 ravioli with 1 tbs [15 mL] butter and 1 tbs [15 mL] pecans per serving). Prepare pasta dough; let rest. (950 mL) saucepan over medium-high heat, heat butter until golden brown. Serve hot butter over cooked ravioli and top with pecans.